Amazon.com description: Product Description: "In most businesses, 80% of the revenue comes from 20% of the customers. Management of these key accounts demands discipline, direction, and purpose. Account managers and salespeople must be able to identify and capture key opportunities and use a systematic approach to growing the accounts. Here's where they'll find the powerful tools, processes, and techniques to succeed. 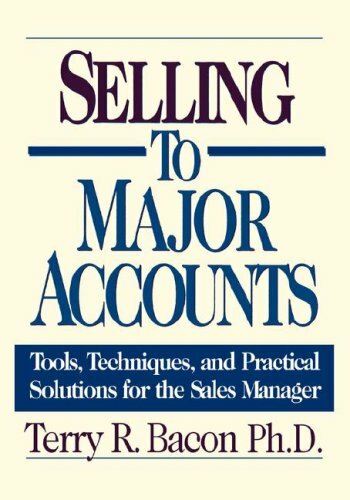 Selling to Major Accounts is full of practical, proven approaches to account management. Loaded with examples, tables, charts, checklists, and real-life case studies from the author's vast consulting experience, it shows how to: * identify the major accounts with the greatest potential * progress from vendor to strategic ally * craft account plans that are geared for action * manage the customer relationship for greater results * develop winning account strategies."